…Annnd we’re back. A big thanks to Kevin and Stan of the SubCulture webcomic for their awesome guest strip last Friday! And yes, jefbot has a hamster! Two, actually. Some of you may remember their introduction from way,way back in JEFBOT.28_Hamster God. As I mentioned in the blog to that strip, I have plans for the hamsters, I just haven’t gotten to their storyline yet. It’s been a long time in the planning, and that arc still won’t be explored for quite a while, but hopefully this will introduce them back into the BOT continuity with more regularity so we can get to their tale sooner. Aiie! Cornfather gains a villain identity – Ferret Face! I mean, hey – if a ferret was hanging off your face, wouldn’t you feel villainous? This one tickled my funny bone! Musashi is an absolutely adorable name, for such an adorable little creature! Me thinks Cornfather needs to invest in a mask of some sorts, so then he can “save some face” *Slaps knee* I made a funny! The last panel is soooooooooo cute–between Jefbots expression, to Musashi’s lil head turned checking out the Abraxas face action. Kudos! ha! love the pun, Spanky! and glad you found the little guy adorable. “musashi” is the name of a russian blue cat of mine (hence the hamster’s grey color) that was adopted by my niece years ago. you can absolutely use that picture as your avatar, Maryz – i’d be flattered! i’m going to change that “Hamster God” strip eventually to reflect the change from Musashi’s brown fur to the grey he’s sporting now, so if you like him brown, you better take it soon! Oh, I forgot about the hamsters! I like this running joke of the ferret on Cornfather’s face — LOL! thanks, Stan – the running joke tickles me, too. poor Cornfather. heheh. Hi there Jeffbot. Been a fan for a while and DaughterJudy convinced me to get a commenting account….by making it for me. Anyways, great comic as always. That’s funny, because it’s so true! Animals LOVE the Cornfather! Awesome job Jefbot! you should meet my sisters, skinny. you never know Michael, Linda could drop off a ferret any day, god forbid. i love that movie, John K! i laugh every time. when did musashi become a rodent? he eats rodents! Yamato, perhaps? After the WWII Japanese battleships? 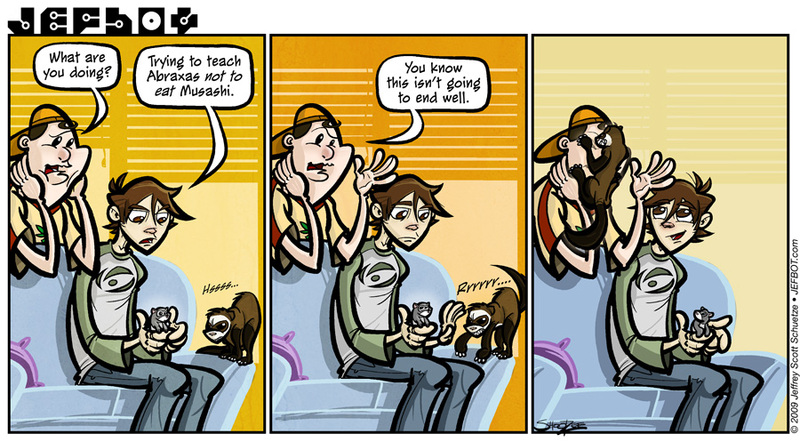 Awww… I wub jefbot’s cute smile in the last panel. It makes me forget what a cunning evil mastermind he is most of the time. And I don’t think Abraxas should STOP harrassing Michael so much. One of these days the Cornfather may SNAP. Hmmm… that would be an interesting story… The “revenge of the Cornfather”. >_> Heck. AND DON’T YOU THINK ABRAXAS SHOULD STOP HARRASSING MICHAEL SO MUCH?!! Or perhaps it’s the lack of caffeine in my blood. Gonna get me a big cup of coffee… but then I would have to get out from under the computer desk… tsk. ha! i liked it better the first way you put it first, Sonitan, with Abraxas NOT stopping his harassment of the Cornfather!!! heheheh. and “Musashi” is named after my former cat (now my niece’s), who was named after the famous samurai, Miyamoto Musashi, and Musashimaru, one of my all-time favorite sumotori. holy hamster hypnosis, JF3! you may be right!!! musashi’s friend is sha-do-do…. ps. I’m back, I’ve been on Vacation. also, do I get any money for subculture using my image? and if so, how much? Don’t forget that it was also an important Province. yes, yes, it ends well for everyone but him HUZZAH!